One of the joys of living in Belize is that being here allows you to stretch your repair muscles. Even though this is paradise, the environment is hard -- on everything. Literally. If you have something, a tool, toy, objet d' art, clothing, yourself... Well, the list could go on forever. Trust me, whatever it is, even if it doesn't do anything, eventually, and sooner than later, it'll break. And not just get a chip on an edge, I mean really break. It's main shaft will split into two pieces, it'll melt, it'll disintegrate, and on and on. If it doesn't break in and of itself, its surroundings will actively work to destroy it. Case in Point... Our pool. It's suffered it's second leak in about as many years. Why? Well, there are a couple of cause, 1) We have an underground creek flowing the length of our property into the canal. We didn't discover this for about 2 or 3 years after we bought and built. We discovered it because we had to go and build a pool - one of life's real pleasures (read necessities) here in the tropics. A veritable life-saver. Of course, the creek apparently goes under a corner of the pool and pump house, which has caused that corner of the pool to dip slightly and 2) We've had over a year of very heavy truck traffic on our road with attendant huge vibrations both coming and going - dump trucks hauling marl, sand, boulders, etc, anywhere from next door, to down the road all the way to the ferry. Did I mention massive vibrations? Huge vibrations, shaking everything and anything as they roared past. And not just a couple of times a day either. Most days during that year, we're talking on the order of twenty to thirty times a day, and sometimes more. it was intense. So, comes the day when the pool starts actually losing water. We peeked between the slats of the deck boards and could actually see water coming out. Bummer. Now we had to do something about it. Who better to call than John Harris, the guy who built the pool. We've always enjoyed a good working relationship with John. He's easy to keep happy. Just fix him a big 'cuppa' tea (two bags, one sugar, and cream), and he's good to go. He and his crew have been together for over eight years and work well as a team. This is the second time we've had John out to fix a leak in the pool. We've always been happy with his work. I think it would be a cheap shot if we were to say, it's John's workmanship. No one knew at the time we built the pool that we would be dealing with an underground stream. If we had, we'd have approached the initial construction differently - pilings and that sort of thing. Hind sight is always 20/20. Anyway, we've got this leak to deal with. The guys came within a couple of days of our call to John. His crew starts early - like around 6:15 AM, and they get to it right away. Thanks to the leak, we had partially drained the pool overnight, so finishing draining it only took about an hour or so that morning. It's not a good idea to leave an in-ground pool with no water for very long. They can and do pop out of the ground. Just check out YouTube for some sobering videos on the topic. The guys got right to it, chiseling about an inch or two wide channel along the major cracks and then laying in hydraulic cement in the body of the crack. After that sets, which takes no time at all (The container says the hydraulic cement has a 15-minute working time. I've used it and I think it's more on the order of 5-minutes.). then you can trowel on some Diamond Brite and feather it in to blend with the pool. 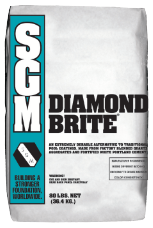 Just for your info, Diamond Brite is made by Southern Grouts and Mortars (SGM) It's a blend of propriatary aggregates and polymer-modified Portland cement. It's available in a variety of colors, textures, and aggregate sizes. High strength and rapid curing allow projects to be completed in the same day. Here's some photos of the repair job underway. The crack that was leaking is the one directly behind the worker in the picture below, not the one under the skimmer in the center. As soon as the cracks are prepared, in goes the hydraulic cement. John's crew in order to accomplish two things, 1) extend the working time, and 2) ensure all of the crack gets filled, uses the hydraulic cement as it comes from the container in powdered form (It's ready to use, already mixed with sand, etc. - everything except water.). After packing the crack with dry cement, then dribbling in water. As the cement gets wet, it tends to slump and fills even more into the crack. Of course, on the vertical surfaces, it is troweled in. As soon as the hydraulic cement sets, then it's time for the Diamond Brite. The guys work fast, partly because the materials don't give much working time. The Diamond Brite gives more, but you still can't dawdle around. Here the guys are feathering the Diamond Brite. Although with the pool empty, you can see the fresh repairs, once water is restored to the pool, that really goes away. After a few days usage, even if you know where to look, it becomes increasingly hard to detect just where the repairs were made. As the work nears the end things start getting cleaned up. The pool is starting to look more like it should once again. As luck would have it, I had recently gotten a replacement wand for my pressure washer. I hadn't even had a chance to try it out to see if it actually worked with my pressure washer unit, so this seemed like the perfect time to give it a try. It worked like a champ. Agusto went all over the pool and lots of marl dust and other grime just melted away. Around the steps is a particularly hard area to keep clean as the dogs use the pool as their personal water dish. They don't swim in it, but they try constantly to drink it dry. And lately, our two cats have begun doing the same thing. It's a good thing I was wearing my shades. As Agusto cleaned the pool, it's brightness factor was increasing exponentially - even with the shade cloth awning overhead. And now, it's the end of the repair job. It's barely noon. In fact, about 11:30 AM. And the pool is ready for water. We still had to wait for an additional hour to ensure that everything had set right. We started filling the pool about 1:00 PM. It takes about nine hours to fill the pool completely. By 3:00 PM, Dianna and I were in the pool in our 'floaties' and enjoying a nice cool one. We shut the water off to the pool just about supper time as filling the pool means the rest of the place has minimal water pressure. We wanted to cook, take showers and get ready for bed. I re-started filling about 8:00 AM the following morning, and it was done by noon. Wouldn't you know it, Huey decided that this was a grand time to stop working. His little rubber feet had worn out and needed replacing. Seems like it's just one thing after another. But that's another story and another posting, down here in paradise. Glad the Calvary came so quick and did such a great job. Is there anything that can be done to reinforce the foundation? How could anyone predict the underground creek? There probably is if money was no object. We're working on a plan for three or four years from now to possibly punch about eight or so pilings through the bottom of the pool and essentially partially rebuild it in place. Revise the top of the side walls so they're level and recast the floor so it's level. Should be cheaper than totally rebuilding the pool. Well, we'll see when we get to that point. I don't know about predicting an underground creek. I do know for the first two years or so that we lived here, we had no indication that anything like that existed on our property. At that time (almost seven years ago now) no one around here had built anything with pilings. We'd heard of the Consejo area needing pilings but not here. How things change. Always something is right... but your guys sure looked to have done a bang-up job. Our neighborhood pool is shaped like a real short dumb bell. The only problem is the pool builders evidently didn't beef up the support in the center enough and over time the water weight in each outer round pool caused a crack right across the center section. Our guys did almost the same repair as yours and you're right -- hard to see it now. I've got enough material for the next two or three posts in progress - all pretty much variations on a theme. I hope the repair holds. We're keeping our fingers crossed. I always keep 'Nils Illegitimus Carborundum' in mind - helps with the positive mental attitude. No leaks in the N Atlantic where J&G & P&R are currently vacationing, Phippsberg, Maine. Come & join us!! Phippsberg, Maine. It's tempting even though I've never heard of the place. I'm working on two more postings of leaks, repairs and reworks... And to top it off, now our kitty-girl April has gone missing. What else can happen? No, don't tell me, I don't want to know. Have a great time up there in Phippsberg. I'll have to look it up.